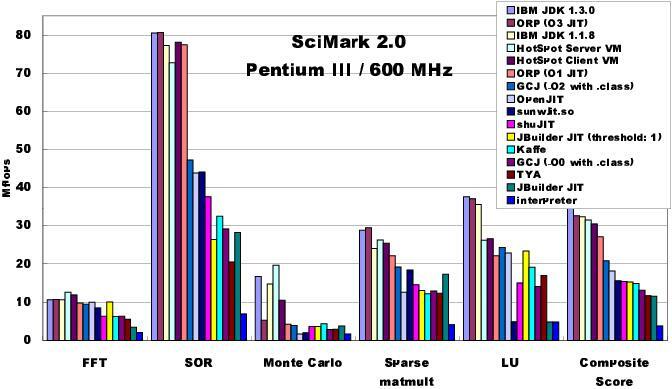 Oct 2004: SPEC JVM98, SciMark 2.0, Linpack benchmark and Eratosthenes Sieve on Pentium 4 and Opteron. 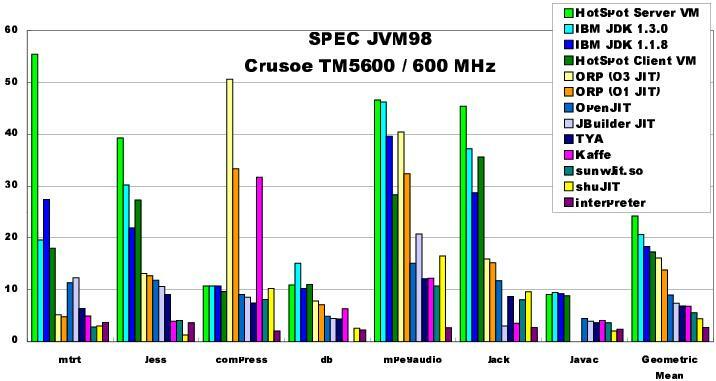 Jan 2002: SPEC JVM98, SciMark 2.0, Linpack benchmark and Eratosthenes Sieve on Pentium 4. 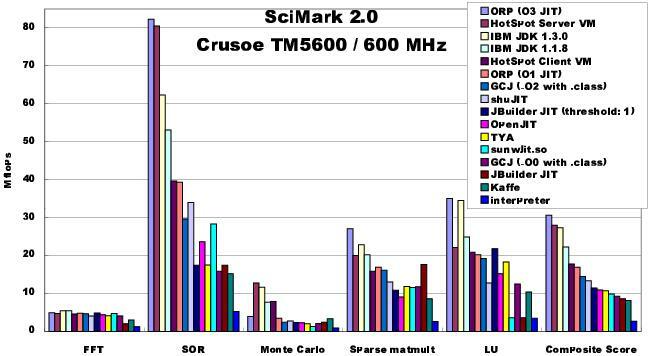 Feb 2001: SPEC JVM98, SciMark 2.0, Linpack benchmark and Eratosthenes Sieve on Pentium III, K6-2 and Crusoe. 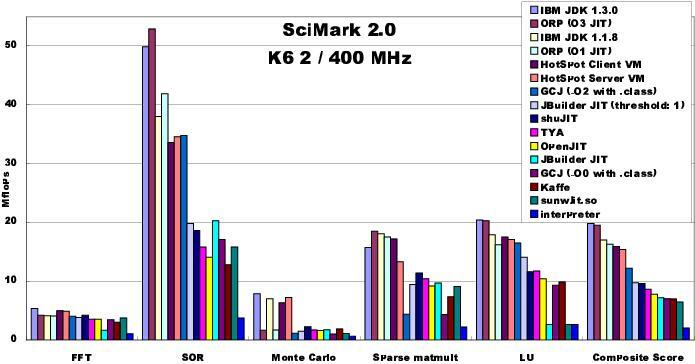 Sep 2000: SPEC JVM98, SciMark 2.0, Linpack benchmark and Eratosthenes Sieve on K6-2. 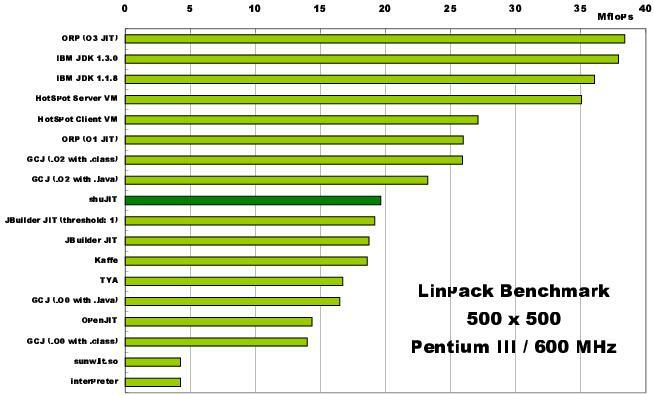 Mar 1999: Eratosthenes Sieve, Linpack benchmark and CaffeineMark 3.0 on Pentium. This page shows results of performance comparisons among Java runtime systems on Linux. 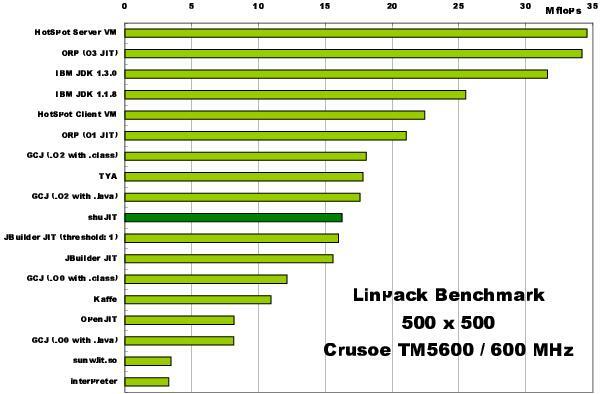 The following benchmarks were applied to many Java runtime systems. Kaffe 1.0.6 by Transvirtual Technologies, Inc.
All results are also available in Mirosoft Excel book format: `JIT-eval-010311.xls'. 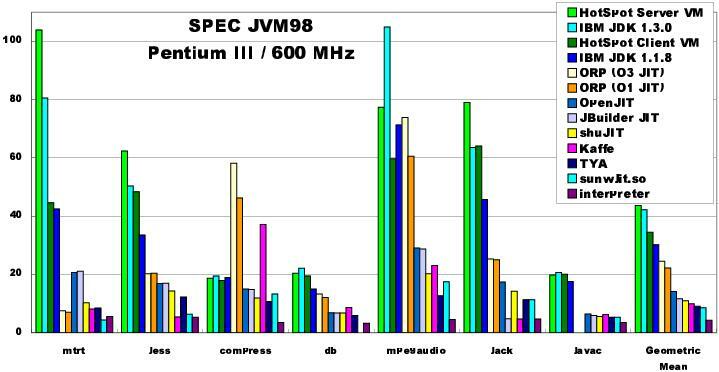 SPEC JVM98 (http://www.spec.org/osg/jvm98/) is a benchmark suite contains real Java applications. and Java parser generator which is now called JavaCC (_228_jack). 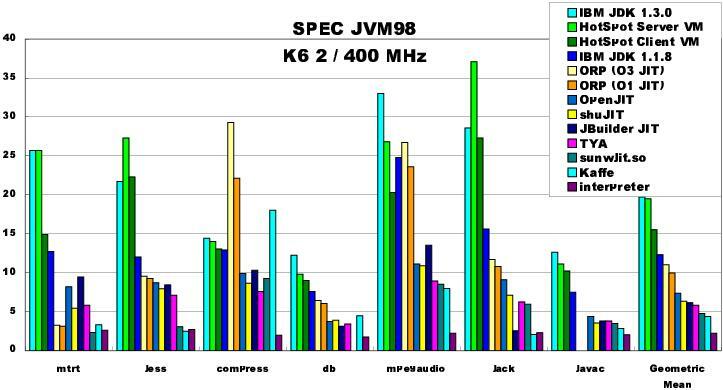 SPEC JVM98 shows scores for each benchmark program and the geometric mean of them. Higher number is better. Maximum and minimum heap size were set as 32 MB. However the Kaffe needs more than 32 MB as heap size. The _201_compress and _213_javac benchmarks stop its execution with OutOfMemoryError if only 32 MB memory is given. I supplied 48 MB to the Kaffe. SciMark 2.0 (http://math.nist.gov/scimark2/) is a benchmark suite based on numerical kernels. They were collected by NIST researchers. I specified the `-large' option to run the large problem size version. SciMark 2.0 shows results in MFlops (mega floating-point operations per second) and the composite score, which is the arithmetic mean of them. Therefore, SOR, which shows relatively higher value, affects the composite score. Oppositely, FFT and Monte Carlo do not very much. Higher number is better because results were in MFlops. (*) In default setting, JBuilder JIT compile a method when it is called for the second time. In this case, that compilation threshold was set as 1, then all methods were compiled as soon as called. 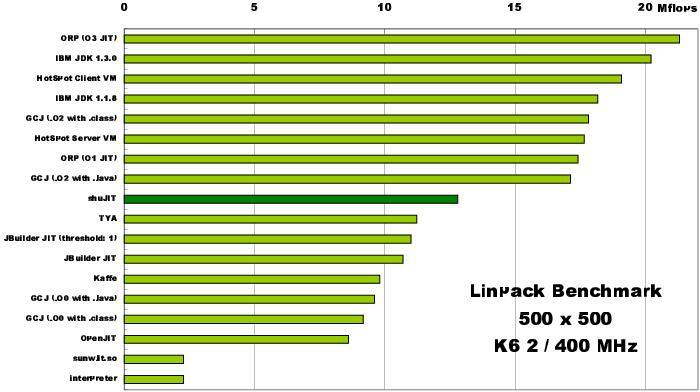 Linpack Benchmark -- Java Version (http://www.netlib.org/benchmark/linpackjava/). The problem size is 500 x 500. The results are in MFlops (mega floating-point operations per second), so higher is better. The TYA archive includes this benchmark as `demo/Sieve.java'. These values are in number of operations per 10 seconds, so higher is better. In this benchmark program, the compilation threshold was set as 1 for JBuilder JIT, then all methods were compiled as soon as called.